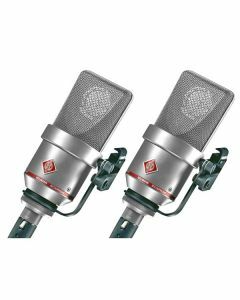 The TLM 170 R condenser microphone is a large diaphragm microphone with multiple polar patterns. Its sound has a very transparent characteristic, in contrast to some of our other microphones that have a distinct personality. Therefore, this microphone is used for many diverse applications in professional recording studios, in broadcasting, film and television, and for semiprofessional productions. The polar patterns can be selected either at the microphone itself, or controlled remotely through the special N 248 power supply. The TLM 170 R was the first microphone to use the successful fet 100 technology. Along with a balanced, transformerless output stage it features extremely low self-noise and an impressive dynamic range. Five directional characteristics are selectable by means of a rotary switch. In the sixth position, marked "R", the directional patterns can be controlled remotely with the N 248 power supply. There is no special cable necessary for this purpose. The microphone has at its rear a 10 dB attenuation switch for extremely high sound pressure levels, and a high-pass filter to suppress structure born noise. The microphone is addressed from the front, marked with the Neumann logo. The large diaphragm capsule inside the headgrille has a very smooth frequency response for all polar patterns over a wide acceptance angle. The curves are flat and parallel to the 0° frequency curve up to 10 kHz within an angle of ± 100°. As a result the TLM 170 R has a very even diffuse-field response for all polar patterns. This is important in a reverberant environment, as more reflections arrive at the microphone from different directions. The acoustic information is not affected in its tonal quality when recorded by the microphone. This characteristic is achieved without resorting to corrective resonance effects. Therefore, the microphone maintains an excellent impulse response reproducing all transient phenomena of music and speech without any coloration. The capsule is elastically mounted to avoid any structure borne noise that could interfere with its operation. In addition to the usual directional polar patterns: omnidirectional, cardioid, and figure-8, we have added a hypercardioid and wide-angle cardioid characteristic. When compared to the standard cardioid pattern, the hypercardioid characteristic suppresses sound from the side more efficiently. The wide-angle polar pattern is especially useful to record large sound sources. The rotary switch on the microphone must be in the position R (= remote control). In this switch position the TLM 170 R microphone analyses the absolute value of the phantom power and selects the corresponding polar pattern. A standard 3-pin microphone cable is used, similar to the microphone's conventional operation. Cable lengths may be up to 300 m (1000 feet). The letters TLM stand for "transformerless microphone". With TLM technology the usual output transformer is replaced by an electronic circuit. As with traditional transformers, it ensures good common mode rejection, and prevents RF interference, that may influence the balanced audio signal. The TLM 170 R is provided with a tilting side bracket to attach the microphone to booms or stands. The bracket is equipped with rubber elements that effectively protect the microphone from mechanical shock. If necessary, it can be mounted on the other side of the microphone as well. When using the IC 4 cable (for example to suspend the microphone from the ceiling with the MNV 87 auditorium hanger), the bracket and its holder need to be removed. The microphone can then be connected to the swivel mount connector of the cable. The TLM 170 R microphone has a 10 dB attenuation switch to prevent the input of the following unit from being overloaded. A second switch at the rear allows to attenuate the frequency response below 100 Hz to suppress undesired structure borne noise. All exposed surfaces of the capsule, including the diaphragms, are at ground potential. This technology makes them highly immune to electrical and atmospheric interference and contamination through dust particles.